Anyone work at Costa Coffee? I guess it's the machine they use. Hmm.... they take the hot chocolate out of a cadburys tin at Costas, and yes it does costa fortuen which is why i need the way they make it :-( oh well, sorry RichKid 10123 don't use starbucks..
And while we are on the theme .... why is it, that despite the credit crunch, Trebor continue to make a mint. And while we are on the theme .... why is it, that despite the credit … And while we are on the theme .... why is it, that despite the credit crunch, Trebor continue to make a mint. 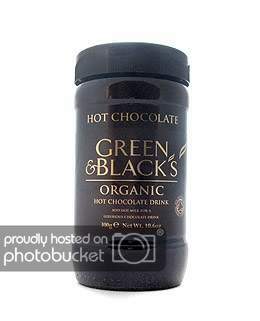 Gonna try that:thumbsup: Only have Fair Trade Hot Chocolate (no very nice) at the moment, but will try the Green and Black brand when it is finished. leah...have you thought about getting one of those little battery opperated whips to froth it up a bit...oh and the best hot choc I ever tried was not cadburys but Green and Blacks organic hot chocolate. leah...have you thought about getting one of those little battery … leah...have you thought about getting one of those little battery opperated whips to froth it up a bit...oh and the best hot choc I ever tried was not cadburys but Green and Blacks organic hot chocolate. Haha, right i have an addiction! grrr! lol stuff it, am off to Asda for some Green & Blacks hot chocolate and an electric whisky thing! haha! i'm gonna end up massive by nxt wk! oh well! thank you all, i promise i wont be on next week posting for diet ideas hehe! Home and Bargain are selling Twinnings Hot Chocolate (it's gorgeous and looks very posh as it comes in a nice tin) for £1.99. I swear by making hot choc with hot milk always - tastes so much better. The mint choc options (it's low fat but you wouldn't know) is also very popular in my house. The hot milk approach does seem to work well, are there any machines which are worth looking into that can produce a good hot chocolate? I've had a look around but can't find any good information on machines that do coffee and hot chocolate as no-one seems interested in the latter. Haha, right i have an addiction! grrr! lol stuff it, am off to Asda for … Haha, right i have an addiction! grrr! lol stuff it, am off to Asda for some Green & Blacks hot chocolate and an electric whisky thing! haha! i'm gonna end up massive by nxt wk! oh well! thank you all, i promise i wont be on next week posting for diet ideas hehe! Where did you get your dolce gusto for that price choc1969? Yeah, they use thier own brand so you can't entirely recreate the taste. But the closest are ones specifically made to be added to hot milk like green and blacks and the cadburys... but it has to be the ones you add hot milk not water, no water goes into a costa HC. It's about 5 heaped tblspoons per 1litre of milk then steamed. If you don't have a milk steamer then boil milk and whisk in the the chocolate. For clump-free hot chocolate I add a splash of milk (or Baileys) to the cup and then mix the chocolate to a paste before adding the hot milk then whizzing with a frother. Tesco & Asda sell something called Spanish Chocolate which is bit pricey (£3.99 ish) but it comes in a very Gucci tin and tastes awesome. Only tried the hot choc in there once and it was very watery,not to my liking at all,i like the Galaxy cups you buy,just add water.